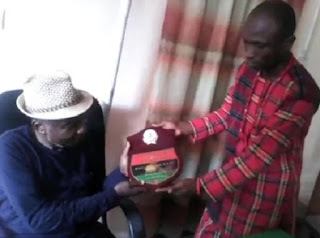 BIAFRA: ILOM group presents Nnamdi Kanu An Award "Kpakpando 1 (Shining star) of Biafra"
An Igbo group based in Port Harcourt, Rivers State, ILOM Igbo Family Unit, has given an award to the detained leader of Indigenous People of Biafra (IPOB), Nnamdi Kanu for his struggles in actualizing the sovereign state of Biafra. The award, Kpakpando 1 (Shinning Star) of Biafra coincided with the demand for the first time by Igbo leaders for Kanu’s release. The award was received by Kanu’s father, Eze Israel Okwu Kanu at his Afara Ukwu home in Umuahia, Abia State. Read Also: Biafra: Afra Descendants Movement (ADM) Declares Support for Biafra...Says "When our Ancestors met the White Man, They told them we are Biafrans And That is what we are." The coordinator of the group, Nwosu Emmanuel said they honoured the IPOB leader because of his untiring efforts in liberating Biafra from what he called the shackles of Nigeria enslavement. We decided to give Nnamdi Kanu, the IPOB leader, the award because we see him as the true Biafra leader; he is the one that will take us to the Promised-land. Deputy coordinator of the group, Chukwunyere Chibuike said Kanu has sacrificed a lot for Biafra and deserved every recognition in Igboland. Eze Kanu said with the award, his son’s spirit would be high even as he is still in detention. Younger brother of the detained IPOB, Emmanuel, showered praises on members of the group, stating that their journey to Umuahia to see members of Kanu’s family was heartwarming. He promised to inform the IPOB leader about the award as soon as possible. I got a chance to earn well through trading even if I am still a student. Just Google Superior Trading System to learn how I did it.